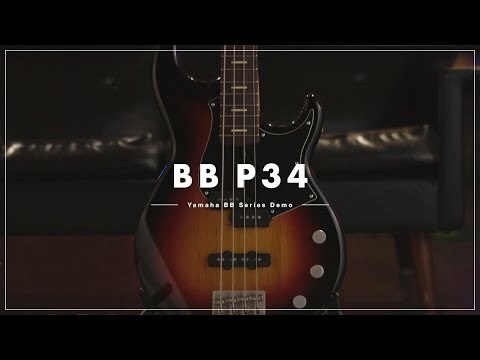 The Yamaha 2017 BBP34 Electric Bass Guitar is the cream of the crop, a worthy successor to the series that began 40 years ago, and continues to push the boundaries of what can be achieved. Making the most of four decades worth of experience, Yamaha have come closer to realising their dream of perfection. The BB Pro models are crafted by a select team of master artisans at Yamaha's HQ in Japan, and incorporate a redesigned alder/maple/alder multi-laminated body with proprietary Initial Response Acceleration (IRA) technology. Building from the ground up, the body is designed to transmit sound from the strings to the body much quicker for increased midrange focus. The result is a response unlike any other BB series bass. As one would expect from a BB series' bass, the body has curves and contours in all the right places. Whether you're playing in a seated or a standing position, the body rests snugly against yours for an effortlessly comfortable playing experience. As part of the improvements made to the 2017 BB Pro models, the neck has been given an overhaul from the joint to the profile. Crafted using a five-piece partnership of maple and mahogany, the mitre neck joint is reinforced using a rugged 6-bolt construction. You can rest assured that no matter how enthusiastically you perform, the neck will be with you every step of the way. The improved thinner neck profile makes it much easier to switch between traditional and modern playing styles. Paired with the neck is a 21-fret rosewood fingerboard, which provides a luxurious playing surface for your fingers to explore. Thanks to the deep double-cutaway body profile, the highest frets are within easy reach. Whether you're recording in the studio or hitting the stage, having a tonally versatile instrument makes life so much easier. The Yamaha BBP34 is equipped with a pair of YGD Custom V7 Alnico single-coils that translate the rich timbre of the tonewoods beautifully. Each pickup is equipped with an independent volume pot, as well as a master tone switch. Create your own blend of each pickup, and carve out the tone with ease. The simplicity of this setup belies the wide-ranging tones that can be pulled from the beauty. The Yamaha 2017 BBP34 Electric Bass Guitar offers superb build quality and durability, making it a great model for session players and gigging professionals. The headstock is home to lightweight tuning machines, which uphold tuning integrity dutifully whilst also improving balance across the bass. The vintage-style bridge anchors strings securely to optimises intonation and sustain throughout the most energetic of performances.